This is an everyday Chinese family comfort food. Normally cook over a stove. But if you are lazy like me and don’t want to watch over the stove like a hawk, the rice cooker is much easier and less messy. Don’t have a rice cooker? You can cook it the traditional way, using a pot. It can be done in 30 minutes, the recipe using a pot, here. 2. Turn on the rice cooker and press the “Congee” function button. 3. Marinate thinly sliced pork with 1/2 tsp of salt, 1/2 tsp white pepper, 1 tbsp sesame oil, 1 tsp cornstarch, 1 tbsp Shaoxing wine, 1/2 tsp sugar). Mix well and set aside. 4. Chop spring onions into small pieces (For garnish later). 5. Slice gingers to long thin stripes. 6. Scrap century eggs’ outer dirt with a teaspoon and cut the eggs into wedges. 7. Open the rice cooker lid after approximately 10 minutes (it should be starting to boil). Add the marinated pork in the boiling congee. 8. Stir and close the lid. You can relax and have a cup of tea until the congee is fully cooked. Taste and adjust the seasoning. Add some light soy sauce or salt if it’s not salty enough. Place Century eggs, ginger and spring onions on top. Drizzle with a teaspoon of sesame oil to lift the flavour. Add some fried shallots if you have them, that would taste even better. Enjoy – Perfect for Weekday Lunch! Of course, if you can’t get century eggs, just cook with the pork itself is good enough. Sometimes we also like to crack an egg and stir in the congee in the last minute to make it extra creamy. Let me know if you like this rice-cooker recipe. 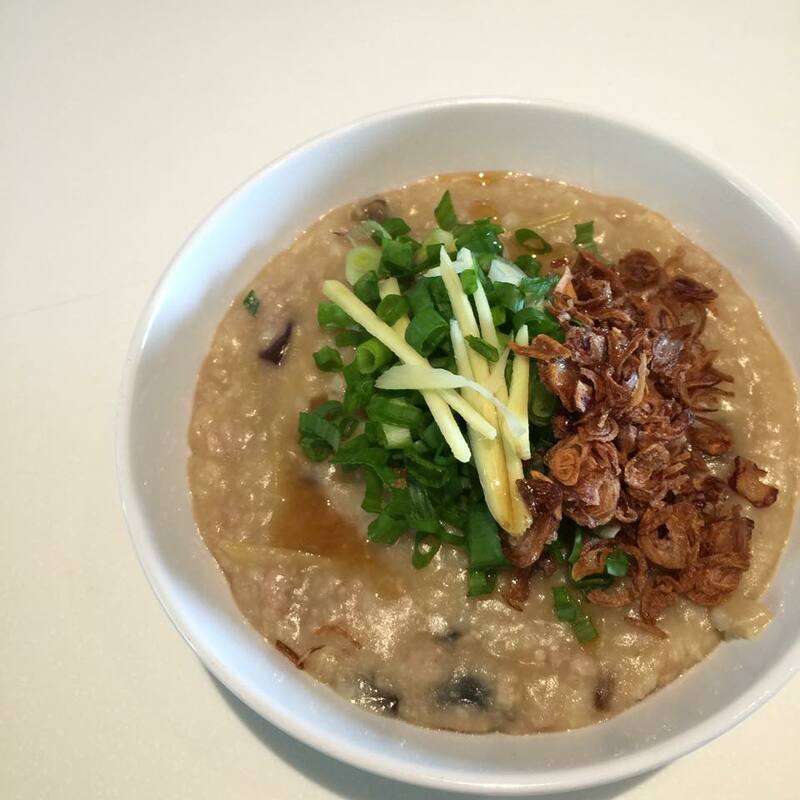 Which is your favourite congee variation?